WASHINGTON (Sputnik) -The US Defense Department has not received any orders to withdraw troops from the Korean Peninsula and is maintaining the same posture in the region, Chief Pentagon Spokesperson Dana White said. "Our department hasn't gotten any order on that. Our posture remains the same," Chief Pentagon Spokesperson Dana White said when asked whether the Pentagon had received instructions to prepare for a possible troop pullout. South Korean President Moon Jae-in on May 2 dismissed the possibility of withdrawing US troops stationed in the country if a peace treaty is signed with North Korea to formally end 1950-1953 Korean War, presidential spokesman Kim Eui-kyeom said, as cited by the Yonhap News Agency. Moon's remarks followed a proposal from his special adviser Moon Chung-in on the withdrawal of US forces in South Korea. The issue has appeared on the agenda following the recent historic meeting between the leaders of the two Koreas in the demilitarized zone (DMZ). On April 27, North Korean leader Kim Jong Un and the South Korean president held a historic summit in the "truce village" of Panmunjom. The sides signed the Declaration for Peace, Prosperity and Unification on the Korean Peninsula. The document commits the two countries to a nuclear-free peninsula and talks to bring a formal end to the Korean War. South and North Korea remain legally at war, as no peace treaty was signed after the Korean War of 1950-1953. The 1953 Korean Armistice Agreement provided for a suspension of open hostilities and a fixed demarcation line with a buffer zone. Washington has maintained its troop presence in South Korea since that time. 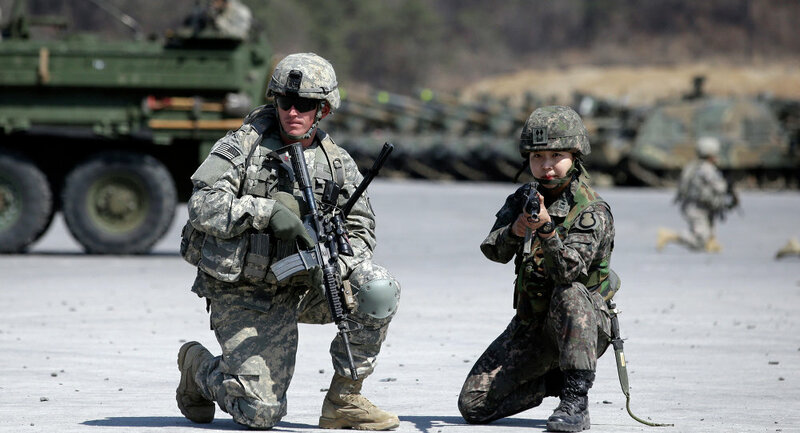 Currently the US has about 28,500 soldiers stationed in South Korea.